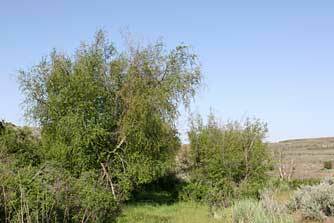 Water birch is appropriately named as it favors wet ground such as riparian valleys where black cottonwood and willow grow, and also canyon springs and streamsides; yet this shrubby tree is tough, able to withstand extremes of heat and cold without a problem. Water birch grows from Alaska to Arizona including Washington east of the Cascade Mountains, where it's rooted in remnant natural areas of the semi-arid Columbia basin. Water birch is an outstanding tree for wildlife, providing winter habitat and a major food source for songbirds and game birds alike. Sharp-tailed grouse, spruce grouse and ruffed grouse eat birch catkins, buds, and seeds and many other bird species such as redpolls, pine siskin, chickadees, and kinglets rely on water birch. Hummingbirds feed on the sap of water birch, in holes in the bark pecked by sapsuckers. 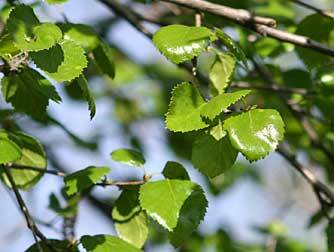 Water birch is also one of the host plants for the pale tiger swallowtail and western tiger swallowtail butterflies. For a sense of their habitat value to the state's threatened sharptail grouse, refer to the description for Scotch Creek Wildlife Area. 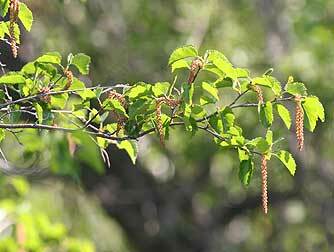 The USDA water birch plant guide (Acrobat file) describes how to propagate and plant Water birch.